This Week in Marvel has one assignment for you, Marvelites -- see Marvel Studios' "Captain Marvel" this weekend so you can tell us what you thought! The biggest news of the week is all about the Marvel Cinematic Universe debut of Carol Danvers. Marvel.com has been covering the premiere and bringing you all the 'Captain Marvel' content you could want! You can check out all of it, including Monday night's livestream of the red carpet event, right here! But that's not all! Marvel is also gearing up for its next massive comic event, War of the Realms! Ryan "Agent M" Penagos sat down with the creators -- writer Jason Aaron, artist Russell Dauterman, and colorist Matt Wilson -- to talk about what fans can expect when the War of the Realms begins next month. Plus: Comedian Matt Braunger sits down with Ryan and Jamie to talk about his advice podcast and his work on " Marvel's Agent Carter"! TWIMURC fans: Ryan has chosen his issues for his first 1960s-themed read! 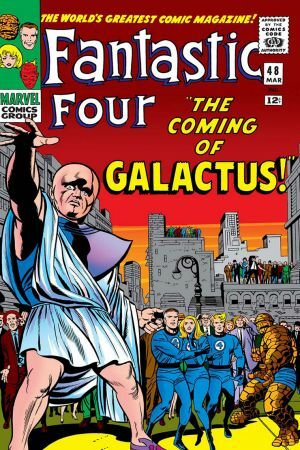 It's FANTASTIC FOUR #48-51! As always. you can find the issues on Marvel Unlimited so you can read along! This week's Question of the Week: What was your favorite part of Marvel Studios' "Captain Marvel"?